One has to ask oneself, Since there is no indication that God commanded a monetary tithe from either Jew or Greek in His Holy Word, why is a man who has been attending Church services for over 30 years kicking a non-tithing member out of Fellowship? In ancient Israel, eleven tribes out of twelve tribes inherited land in Canaan, land that God promised Jacob and his descendants. (see Genesis 28:12-15) The tribe of Levi would inherit tithes instead land. The Levites were assigned stations and jobs in the Tabernacle, and later the Temple, of God. The tithes were used to sustain the Levites and their families. In AD 70, after General Titus invaded Jerusalem and destroyed the Temple, the Levites scattered. No more Temple, no genealogical records of which Israelite belonged to which tribe, The tribe of Levi could no longer receive tithes from the other eleven tribes. Today, many pastors try to lay claim to a tithe of their congregations paychecks and household income. They do so by telling their congregations that the Levites were ministers of the Temple and were the only ones eligible to receive tithes, which was a type and shadow of they themselves as ministers of the Church qualified to receive tithes. Aside from the fact that the tithes that God commanded were agricultural and not monetary, (see Leviticus 27:30-33) there are other serious flaws in the alleged ‘official right’ to receive tithes that these pastors claim. Our Biblical text in this article is from Numbers 18:24-26. It declared that the Levites were to receive the tithes because they had no inheritance among the congregation of Israel. Do pastors have an inheritance? I am not talking about the property they own in their towns and neighborhoods where they minister, God didn’t give us the land we are on; nor did He give pastors the land they live on. So this land is not our inheritance. I am speaking of the inheritance that is promised every man, woman and child who places their trust in Christ Jesus. Romans 8:16-19 The Spirit itself beareth witness with our spirit, that we are the children of God: And if children, then heirs; heirs of God, and joint-heirs with Christ; if so be that we suffer with him, that we may be also glorified together. For I reckon that the sufferings of this present time are not worthy to be compared with the glory which shall be revealed in us. For the earnest expectation of the creature waiteth for the manifestation of the sons of God. Interesting…our inheritance is with Christ. But wait! If pastor’s too are saved, then they, like us, also should have an inheritance with Christ. And if they have an inheritance with Christ, they are not eligible to receive tithes of any member of the Body of Christ. In the Bible, only those who had no other inheritance were eligible to take tithes of the congregation. That is…unless…by taking tithes of the congregation, pastors are forfeiting an inheritance among the body of Christ. How sad, to think that one would rather have tithes of money in this life, tithes that God never authorized that one to receive in the first place, than to have an inheritance that fadeth not away. By demanding tithes, pastors are, in effect, telling God that they reject His Son and any eternal inheritance in Heaven. The one receiving tithes was to receive NO INHERITANCE among the ones that received an inheritance. Children/Congregation of Israel – Inheritance was Canaan; i.e., that land promised in the Old Testament. Levites/Ministers of the Tabernacle/Temple – Inheritance was tithes, but no land. The saved of God – inheritance is a mansion in the Father’s House. 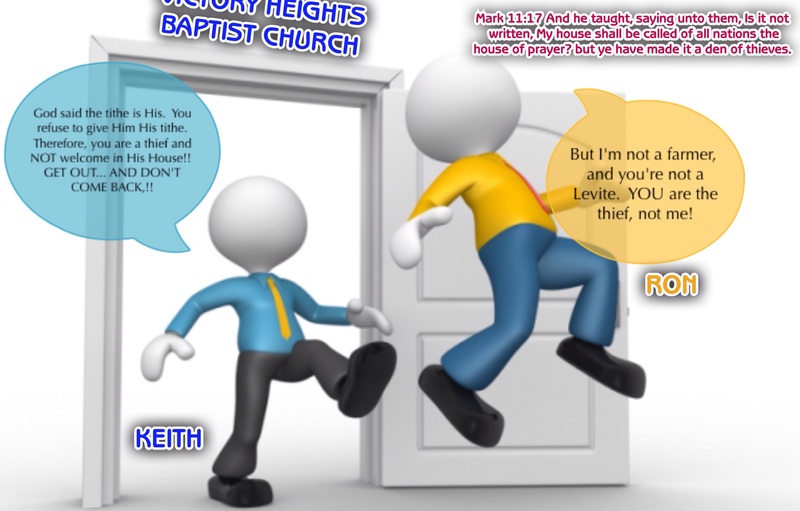 The minister of the Ekklesia – is his inheritance tithes? or is it in the Father’s House? If tithes, they have no inheritance in the Father’s House. Can we be sure? Well, according to Revelation, 22:15, whosoever loveth and maketh a lie will not be part of God’s eternal Kingdom. Since God said His holy tithe was agricultural, isn’t it a lie to say it is monetary? And if one embraces that lie, is it not the same as loving that lie more than the truth if the truth has been in their hands all along, yet they refuse to preach or teach it? Many tithe-teachers and their followers often claim that tithing began before the Mosaic Law, continued in the Mosaic Law, and continues to this day. It is my belief that the tithe has been rescinded, and I believe the Scripture supports my belief. in Acts 15, in the account relating the order of meeting in AD 51 at the Jerusalem Council, and the fact that tithes was not in the list of “necessary things” tells me that the Holy Ghost did not see tithes as being something that was “necessary” for the Gentile Believers to observe. The word “rescind” means, “to revoke; to cancel; to repeal”. Since God determined tithing to be necessary under the Law, and the Holy Spirit did not see it as necessary under the New Covenant, I would have to say it was repealed; i.e., rescinded. That, and then the complete lack of instruction to tithe in any of the Epistles would more than suggest that tithes were, without a doubt, rescinded. We further read in Ephesians 2:14-15 that the handwriting of ordinances, (the Mosaic Law) was abolished by the Lord Jesus Christ Himself. Abolished! Cancelled! Rescinded. The command to tithe was rescinded at the cross. The Holy Spirit re-affirmed that there is no command to tithe twenty-two years later at the Jerusalem Council. The Apostle James reiterated the fact that tithing was not a necessary thing in AD 59,… eight years after the Jerusalem Council. Pastors and lay-pastors alike would do well to leave the tithe command where God left it,… at the cross of Christ, and begin teaching giving out of a heart of love. Pastors and Televangelist’s alike will often use the “You were not wise with the other 90%” card when a faithful tither questions them as to why God has not blessed them. The thing is, nowhere in the Word of God is there a disclaimer that one must be faithful with 90% in order to receive the promised abundant blessing attached to God’s holy tithe. Preacher’s and Televangelist’s do not want their audiences to know that fact. God said in Malachi, “Tithe… and I will…,” not “Tithe, be wise in the other 90%, and I will…”. The Word of God will expose the charlatan’s for what they are, if only the people of the congregations/audiences will only open their eyes to the manipulative tactics being fed them. If you are a faithful tither, and have never seen the abundant blessing that God said the tither would not have room enough to receive, there is a reason… His tithe was for ancient Israel, not for you. Your pastors and teachers have deceived you into foolishly giving them 10% of your money when that was not God’s will at all. Does “tithe of all things” and “tithe of dedicated things” in 2 Chronicles 31:1-12 mean that things other than agricultural produce and livestock were tithed in ancient Israel? The author is trying to convey that not only were firstfruits of the increase of the field brought to the storehouse, but the tithes of the increase of the field were also brought to the storehouse. This is easily seen as we continue to examine 2 Chronicles 31:1-12. 2 Chronicles 31:5 And as soon as the commandment came abroad, CHILDREN OF ISRAEL brought in abundance the firstfruits of corn, wine, and oil, and honey, and of all the increase of the field; and the tithe of all things brought they in abundantly. 2 Chronicles 31:5-6 And as soon as the commandment came abroad, the children of Israel brought in abundance the firstfruits of corn, wine, and oil, and honey, and of all the increase of the field; and THE TITHE OF ALL THINGS brought they in abundantly. And concerning the children of Israel and Judah, that dwelt in the cities of Judah, they also brought in the tithe of oxen and sheep, and the tithe of holy things which were consecrated unto the LORD their God, and laid them by heaps. Again, the Priest Azariah was specific in stating that the tithes referred to in 2 Chronicles 31:1-12 were agricultural. That which was in heaps was what was LEFT after the Levites and Priests had ate all they were able to eat. When one breaks the text down by addressing simple questions, it is easy to see that the “tithe of all things,” and the “tithe of dedicated things” was nothing more than agricultural increase from the fields as proscribed by the Law handed down to Moses for the children of Israel in Mount Sinai nearly seven hundred years earlier. The proper teaching from Malachi 3:7-11 should be that the curse associated with not tithing was allowing the locusts to eat the crops, (v.11) and withholding of rain (Gen. 7:5; 8:2)… not loss of money, loss of job, ill health, automotive engine failures, broken families, etc.. The proper teaching from Malachi 3:7-11 should be that the blessings associated with tithing was God sending rain from heaven (Gen. 7:5; 8:2; Mal. 3:11) and preventing the locust from eating the crops… bringing about a bountiful harvest… not more money, better job, good health, perfect running vehicles, close-knit family, etc.. The proper teaching from Malachi 3:7-11 is that rhe rebuke and admonition was delivered to the Priests of Israel, (Mal. 2:1) not to the Church. The Church was not robbing God… the Priests of Israel were. Pastors need to allow the light to shine upon their hearts and minds as they study God’s Word. Take off the blinders of religion, opinion, and tradition; interpret the Scripture with the mind of Christ. If they do, God will reveal to them that which He has revealed to many concerning the tithes of the Mosaic/Levitic Law. If they allow God’s Word to speak for itself, they will come to no other conclusion than that God never imposed a monetary tithe upon Tabernacle, Temple, Synagogue or Church. Ever hear one who says he doesn’t believe in tithing say, “The Bible says that if you sow sparingly, you will reap sparingly. If you sow bountifully, you will reap bountifully. You should give at least ten percent.”? I have. There’s only one problem with that. It ain’t Biblical. To the poor, three percent of their money might be considered bountiful giving. Paul reminded the Brethren in 1 Corinthians 8 that he did not mean for them to give in such a manner that others are eased, and they themselves burdened. If giving at least ten percent of his or her monoey will put that person in financial duress for the rest of the month, if it means they will not have needed medications, if it threatens their ability to keep their homes, then they should not be giving it. Even three percent God can use mightily. Was He not able to feed a crowd of more than five thousand with just a few loaves and fishes? Is He not the same today as He was then? God has the power to take three percent, and do with it what an hundred percent can do. Is there yet faith in the Earth? There is no need to try to guilt or shame people into giving more than they can afford to give by telling them they should be giving at least ten percent. In Acts 4:32ff, it was only those who owned land and houses who contributed. Are we to believe the ones who lacked were made to look like cheapskates because they were not giving at least ten percent? I don’t. In the same chapter that speaks of bountiful giving, we are told that each must choose for himself what his giving measure is. They should not be bullied into giving “at least ten percent.” Rather, their giving should be a personal matter between them and the Lord. Bottom line… You who are insisting that others should be giving “at least ten percent,” worry about your own giving. Stay out of other people’s pockets. The amount they choose to give is none of your business.